Certification in compliance with FSSC 22000 (version 4.1). The audit and certification scheme of food safety management systems for food packaging manufacturers and it is based on the International Standard ISO 22000:2005* „Food Safety Management Systems. Requirements for any organization from the food chain”, ISO/TS 22002-4:2013 "Prerequisite programmes on food safety -- Part 4: Food packaging manufacturing” and a series of FSSC additional requirements. These additional requirements are described in Regulation R-01SSA / chapter 2.1.4, section http://www.srac.ro/ro/documente-certificare. Maintenance of the substantiation on the Codex Alimentarius that represents the basis of the legislation regarding food safety. 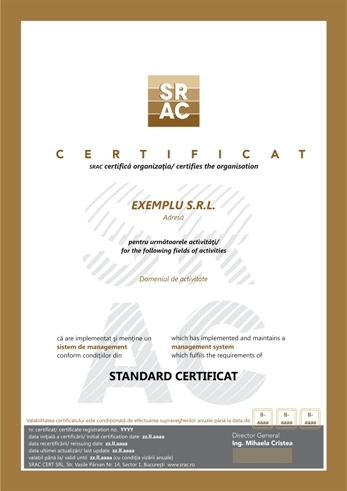 SRAC CERT is the first Romanian certification body that has received the license to issue accredited certifications based on FSSC 22000 scheme being recognized by The Foundation for Food Safety Certification (FSSC) in the Netherlands [visit http://www.fssc22000.com]. SRAC CERT is accredited by RENAR (certificate No. SMFS 002) as certification body for food safety management system certification (reference standards SR EN ISO 22000:2005; ISO/TS 22002-1:2009; ISO/TS 22002-4:2013 and extra criteria of FSSC 22000 version 4.1/2017). are regularly informed on the evolutions in the food safety areas, by accessing SRAC website, events organized by SRAC. Finally, SRAC can supply to its clients with a training offer in the field, which includes training courses of "Auditor in the food safety field” and "Manager in the food safety field”. For more details, please access the Training Section on www.srac.ro. Food safety represents a global concern, not only duet o the impact on public health, but to the one on international trade as well. Globalization of food production and acquisition makes food chains become more complex, and increases the risk of incidents of food safety incidents. Parallel to this development there is an increasing need for the implementation and certification of some management schemes/standards more and more efficient, in order to keep this risk under control. FSSC 22000 is one of the certification schemes that is very appreciated on the market.